One of the most appreciated Italian travel destinations, Verona is one of those cities that can really satisfy everyone, and the variety of the tourist offer is certainly one of the strengths of this beautiful city. The most famous attraction in Verona, which is become the symbol of the city, is probably the arena, which attracts tourists not only for its historic, artistic and architectonic importance, but also because every year it hosts one of the most emotional and famous opera season in Italy. The amphitheatre, which dates back to the 1st century, is one of the examples of recreational roman architecture that has best preserved, and it is also the third bigger roman amphitheatre in Italy (after the Capua amphitheatre and the Coliseum, of course), and nowadays it is visited by many tourists every year. A visit to the city must include a visit to the arena, but the city also has many other monuments and buildings that are worth a visit, like the roman theatre, which dates back to the 1st century B.C., and the two roman doors of the 1st century A.D. (Porta Borsari and Porta Leoni) and the bridge Ponte Pietra, which is also roman. There are also Middle-Ages monuments, like the basilica of San Zeno, the homonymous abbey and the cathedral, which is also called Santa Maria Matricolare. Verona is sited in Italy's Veneto quarter between Venice and Milan. Shakespeare's well-known tragedy, the celebrated Romeo and Juliet was set in this city. 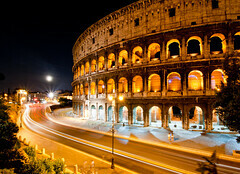 This city of romance also boasts of numerous historic structures including the famous Roman Arena. Catullo Airport is the nearest airport from Verona operating budget flights from cities like Dublin, Brussels, Paris and London. Venice's Marco Polo Airport provides another option to reach Verona by plane. Verona Porta Nuova train station is connected to Milan, Venice and Munich via Euro City trains. For local transportation City bus service offers frequent bus services from Porta Nuova rail station. Le Marche, is a region that the Italian's describe as "all of Italy in one province" as it encapsulates everything from dramatic mountains to rolling hills sprinkled with Medieval villages and more. The region is bordered by neighbours Tuscany, Umbria, Abruzzo and Emilia Romagna and shares many of their best geographical features, yet is relatively undiscovered and surprisingly accessible. The Marchighiani, or people of Le Marche, remain closely linked to the land and life here is centred on the family and on self-sufficient communities of farmers and craftsmen, where the local Le Marche market consumes most of the local produce. The wonderful medieval Le Marche towns offer the visitor an amazing range of history and historic architecture, that ranges from Art Nouveaux villas to characteristic stone cottages, and are home to wonderful art, over 1000 working theatres, fantastic markets and year round festas where you can sing and dance, eat and drink great local fayre, and enjoy the local crafts and customs. Sicilian restaurants offer up some of the best cuisine in the world. Italy has always been known for its great food, and Sicilian food is no exception to this. And it isn't only the food that makes eating in a Sicilian restaurant a memorable experience, the leisurely way it is presented has made it into a high art. The approach to Sicilian eating is the grandest of the meeting of the ways between the best folk traditions and the best aristocratic ones. 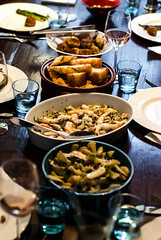 Sicilian cuisine reflects the unique and diverse cultural heritage taken from its history. Sicilian dining is an experience surely to be enjoyed. Although it is understandably difficult to prise yourself away from the idyllic surrounds offered to your family at your rental villas in Tuscany, there is more to Italy than lolling around poolside under the warm Tuscan sun. A perfect day begins with a delicious and nutritious breakfast. The region is conducive to rising early, the sounds of birds and a balmy breeze beg you to leap out of bed and take an early morning constitutional to one of the nearby farmer's markets. Here you can buy any manner of fresh produce, still throbbing with life force. The markets here are famous for the availability of organic produce that has arrived directly from the farm. Wherever you go walking in Italy, there's guaranteed to be a plethora of amazing sights and places of historical interest to discover. For those who go walking hoping to feel a connection to the places they choose, there are many locations in Italy that seem to reveal something of the place, whether it's the architecture, the culture, the history, or even just the spirit of the area. Take a look at these top sights to see while you're walking in Italy. Although they are popular as tourist destinations, don't let any bias towards this fool you - there is a lot to be said for some of the most famous sights of the country.